Our family of 5 is comprised of three kids ages 9, 13 and 15, and two seasoned traveler adults. Home is in the Washington, DC area and we recently traveled to explore India, the country where my husband grew up. All in all, I think we did pretty well, though looking at the stats, we definitely could have done better. I counted EpiPens (emergency auto-injectors for epinephrine, a stimulant used to stop an allergic reaction) and packed the asthma inhaler, extra Benadryl, our malaria pills and some diarrhea meds, just in case. My every-day purse has a stash of Advil and Sudafed. 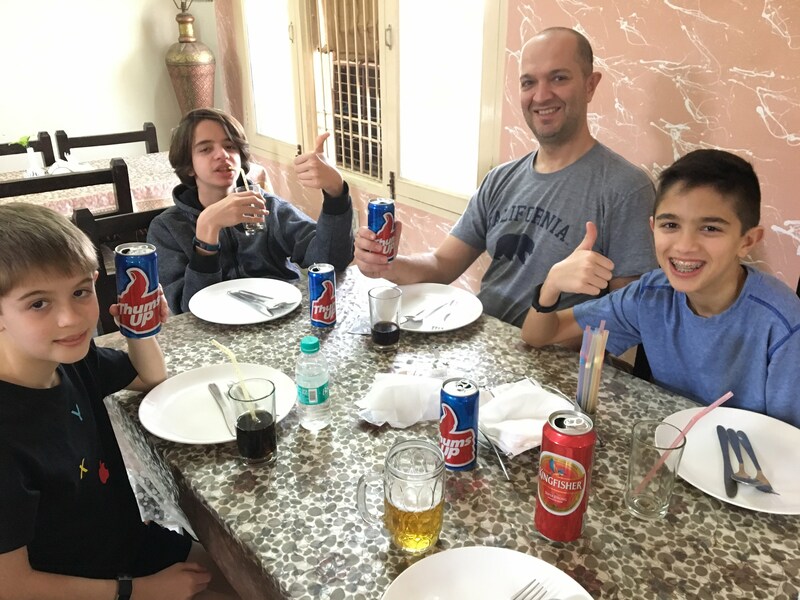 We left feeling pretty well prepared for our two weeks of adventure in India. 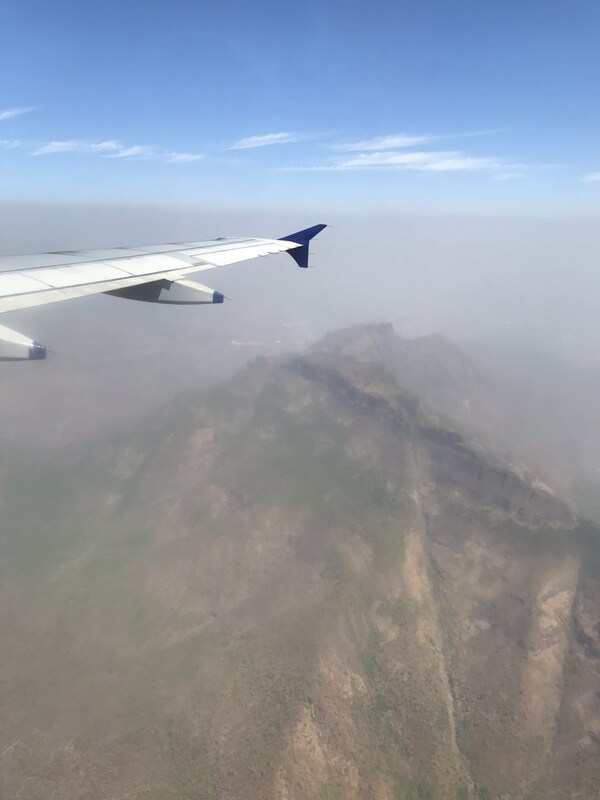 Leaving Jaipur, visibly poor air quality. That was, until day three when the pollution took away my voice and I couldn’t stop coughing. It was: THAT. BAD. To summarize: pollution = bad. Albuterol = good. It really was my food-allergic/asthmatic son that we worried the most about while envisioning the trip to India. Our travel experience previously taught us that it was good practice to bring safe foods, understand cultural barriers regarding food and food prep, and be prepared. Thanks to his pre-trip regimen of steroids, he only needed a few puffs of Albuterol the whole trip, which was awesome. Hilton Garden Inn, Saket – Awesome restaurant and great with food allergies. And we did ok with food allergy prevention/mitigation too. The first week was harder than the second since we were in hotels and had to eat in restaurants for every meal. 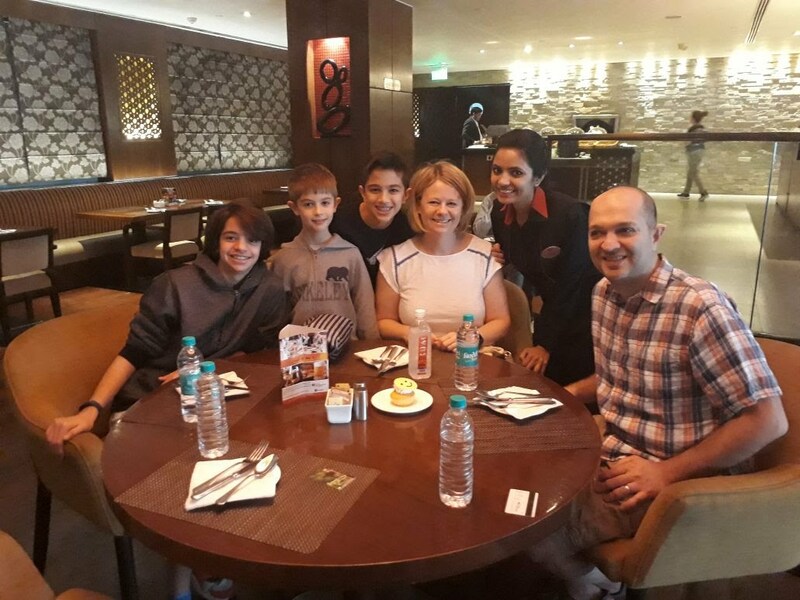 He had to eat a few packaged things here and there when we just didn’t feel comfortable with the restaurant or airline, particularly on Emirates Airlines and while dining at the Raddison Blu in Agra. Emirates, surprisingly, told me “oh, if you have a nut allergy you need to bring your own food.” Now, had I been a good mom and called them AHEAD of time, it would have been better. I think my experienced traveler status had me super comfortable that I could figure things out on the fly. And I could – we had a backpack full of packaged junk food, like pop tarts, cookies, crackers and granola bites. So when I realized – at 40,000 feet above the Atlantic – that Emirates doesn’t provide anything more than a banana that is safe for nut allergies, my son didn’t have to go hungry. Now, this isn’t meant to malign the airline, I didn’t call ahead. But, as someone who eats gluten-free (intolerance, not a severe allergy) I was impressed that I could select a GF meal (among a LONG list of other meal preferences) but none of course were nut-free. In India, nuts. are. everywhere. We knew this, and it was honestly the biggest reason we hadn’t traveled to India sooner. At least by waiting until my son was 9, he had outgrown his egg and dairy allergies, which makes traveling SO MUCH EASIER. But our experience demonstrates that knowledge and preparedness is not a solution for absolute attentiveness. Unfortunately for my son, we learned the hard way that having too many people watching out for his well being actually created more confusion and less protection. After twelve days in India, he ate a small bite of chicken that had (we later learned) been marinated in a yogurt and cashew mixture. Cue allergic reaction and his request for an EpiPen. We were literally next door to the local hospital in Mumbai, and sitting with a cousin who is an M.D., so we were covered in case he had a rebound reaction. Luckily he recovered quickly and was able to enjoy the rest of his day. This was his third serious allergic reaction in his life, and the first where he seemed in control and calm. Afterwards, he was almost amazed that he ate something that he was allergic to and was calm with getting the EpiPen. I am still queasy just thinking about it – his having an allergic reaction while traveling abroad has always been our nightmare and was a significant reason why we didn’t do more traveling while he was younger. And here we were, living our nightmare. We are quite aware that the situation could have been far more serious, and know we got very lucky that he was fine. Living with food allergies is tough; traveling while managing significant food allergies is even tougher. But despite the challenges, and frankly the risk, our family will continue to prioritize travel and exploration, and will apply the lessons learned in India to make future travel even safer. If I have any concluding advice for other families considering international travel with their food-allergic children, it is: trust yourself, travel heavy with food from home, and do enough research so that you have an action plan if your nightmare happens.